The Cat Tree MoMo the latest addition to our luxury range of high-quality and high strength cat furniture! Weighing in at just under 60kg and standing at a great height of 180 cm. 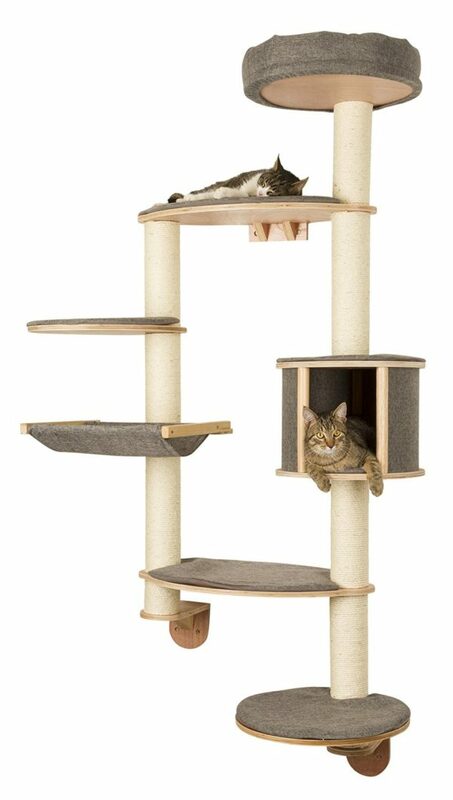 Your feline friend will have unrestricted views of their surroundings and will truly love to go on their own adventure as they navigate this mighty kitty construction..
You will also take great pleasure in watching them attempts to reach the summit! The black sisal rope has been carefully hand glued to the posts to ensure that they remain in place at all times and the spacious ground level cat house can happily accommodate multiple felines at the same time. The thick and chunky dangling rope provides an extra element of fun and everything has been finished off with a beautifully soft and plush material!